Little ones don't always keep germ safety as a top priority, they are always putting their hands in their mouths and willing to eat off almost any surface. Which is why I am always on the lookout for cleaning products that offer a safe, clean, natural, and effective way to clean. Natural House has sent me their curious cleaning product Surfy, which I have come to find amazing. are superior to those currently on the market! ~Our products use an Eco-friendly cleaning method of probiotics that create a beneficial, odor eating ecosystem to naturally drive out and digest odors at their source. ~Natural House's plant-based ingredients are Eco-friendly, non-toxic and biodegradable to naturally fight the toughest problems you face in your house. ~Our products, Sinky and Flushy even break down and digest fats, oil, grease, and solid waste to ensure your disposal, pipes, drain lines or septic tank run smoothly. ~Our cleaners contain good probiotics which continue to scour, clean, consume odors, grime, grease, and germs, and they continue to do so until your next weekly treatment! ~We earned the coveted Retailers’ Choice Award” at the 2011 National Hardware Show! ~The surfaces in your house are like a garden. If you don’t seed with good plants, weeds will grow. You have the same choice with your household surfaces: sanitize for a moment with harsh chemicals leaving your surface open to recontamination or seed with probiotics to continuously weed out the bad micro-organisms. ~Traditional cleaners “clean” a surface for a moment in time; the second the rag is finished wiping the surface, that surface is almost instantly polluted once again with ambient dust, dirt, and micro-organisms. ~Natural House probiotics creates mini-ecosystem on a microbial level that produces enzymes which break down odors, dirt, fats, oil, grease, food scraps, waste and toilet paper products on a continuous basis between applications. This creates a natural, clean, balanced environment that is safe for even the most sensitive members of your natural house. ~The action is in the foam! When using your Natural House products be sure and let it foam first to release the cleaning agents before going to the next step on the package directions. Surfy All Surface Probiotic Cleaner is a revolutionary surface cleaner. Our professional strength formula powers through grease, grime and germs while leaving a streak free sheen. 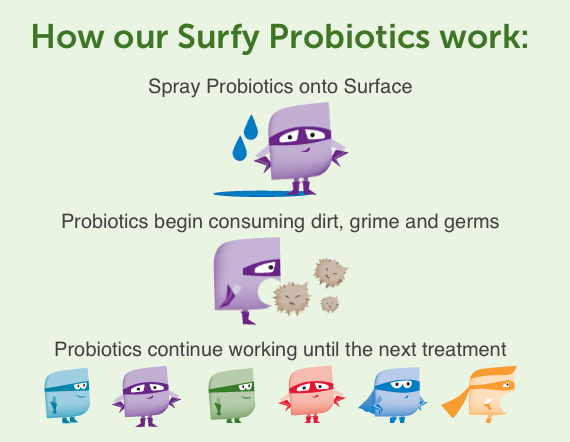 Our probiotics continue to consume germs on the surface after you are done cleaning. Surfy is safe to use on multiple surfaces in the kitchen and bathroom, including counter tops, appliances, sinks, glass, stainless steel, toilets and tubs. ~Industry-First, Cutting-Edge Probiotic Cleaning Product. I was so happy when I received 'Surfy' All Purpose Cleaner for a review. Since the surfaces it seems like I am constantly cleaning are my counter tops, I knew that I would be putting 'Surfy' to the test. I noticed right away how well the bottle sprayer worked and how evenly the mist allowed the product to cover the surface. This is a dye-free product, so you do not have to worry about anything getting stained. There is also a very nice Lavender Sage scent that is offered with Surfy. It is not too potent but offers a nice scent that lingers on the counters. About the company: Natural House is a line of all natural, probiotic cleaning solutions for the messiest places in your natural house. The surfaces in your house are like a garden. If you don’t seed with good plants, weeds will grow. You have the same choice with your household surfaces: sanitize for a moment with harsh chemicals or seed with probiotics to weed out the bad bacteria. Natural House uses care- fully selected non-pathogenic and non-toxic probiotic bacteria combined with natural, plant- based, biodegradable synergistic ingredients to plow through the toughest cleaning problems in your natural house. Where to purchase: You are able to make purchases from the Natural House website. You are also able to make purchases from Amazon . Natural House probiotics creates mini-ecosystem on a microbial level that produces..
On the option to follow via NB, it says: Follow me via Network Blogs and leave your id..but there is no slot to type in your id. I would love to try flushy!